Once-upon-a-time, there was a roaster in Nottingham called 200 Degrees. Then, after a little while, there was a coffee shop. And, that, it seemed, was that. Until this summer, when suddenly up sprang two more coffee shops, one in Birmingham and this one, on Carrington Street, next to Nottingham Station. Now, in fairness to 200 Degrees, I’ve known about the second Nottingham branch ever since I visited the original in the city centre last summer. It’s just that, as is so often the case with coffee shops in older buildings, everything took that little bit longer and summer last year slipped into autumn, then winter, before turning into spring and finally, summer this year! However, it was definitely worth the wait: the new 200 Degrees is quite stunning. All three coffee shops are elegant, but this one even more so. Plus, with its glass front and side windows overlooking the canal, it’s easily the brightest of the three. The usual 200 Degrees elements are all there: plentiful seating, house-blend, guest and decaf on espresso, with a single-origin filter and another on nitro-cold brew. This is all backed up with some excellent breakfast and lunchtime options, with cake throughout the day. 200 Degrees’ second Nottingham coffee shop opened in July 2016, next to Nottingham train station, providing the perfect welcome to the city, or a lovely parting gift. I should know, I partook of both! Located on Carrington Street as it crosses the canal, 200 Degrees benefits from having an entirely glass front, plus a significant set of windows overlooking the canal, so, despite being quite deep, there’s plenty of light at the back. The recessed door is just off-centre to the left, leading you into a large L-shaped space. To the right, in the bottom of the L, is the counter/serving area, which has sensibly been left clear of tables, giving plenty of room for customers to order and, if taking-away, wait for their coffee. The counter’s an L-shaped affair, running down the right-hand wall, where you’ll find the food and till, before continuing along the back wall, home to the Black Eagle espresso machine, its grinders and the brew-bar, where 200 Degrees prepares V60s and Aeropresses. All the seating is to the left, in the upward stroke of the L. Next to the door, a slightly raised seating area is separated by railings. It has two three-person window bars, one overlooking the street, the other, the canal. There are also two two-person tables there, one to either side. The bulk of the seating, however, stretches out ahead of you. If you’ve been to either the new Birmingham branch or the original in the city centre, things will seem familiar. There’s a long, padded bench to the left, with a row of two-person tables, while to the right, there’s an open fireplace, with a neon-effect fire. This has three two-person tables running in a row alongside it. Finally, right at the back, there’s another handful of tables, mostly two- and four-person ones. Wooden floorboards, wood-cladding and exposed brick abound, giving 200 Degrees a truly elegant feel. When it comes to the coffee, 200 Degrees is unashamedly looking to the mainstream market, a gateway, if you like, to speciality coffee. The main house-blend, Brazilian Love Affair, has a sprinkling of Robusta which won’t please some purists, but is very popular with the locals. However, there’s always a guest option on espresso, usually a single-origin, with another single-origin on filter and a third on nitro cold-brew, which is available on tap. These choices, by the way, are the same in all three 200 Degrees, with the guest espresso and filter changing every six weeks or so. 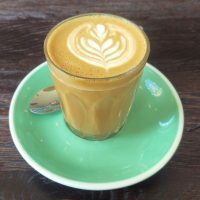 Having tried the filter, a Tanzanian, when I visited the Birmingham branch, I went for the guest, an Indonesian Gayo Mandiri, which was recommended by none other than Roaster Mike, who does all of 200 Degrees roasting, with the barista suggesting I try it as a piccolo. Both these recommendations were spot on, with the bold flavours of the coffee cutting strongly through the milk, but never at odds with it. I also tried, at Mike’s insistence, the nitro cold-brew, made with an Augustino Forest Colombian. This, I have to confess, was a big surprise. Normally I’m not a cold-brew fan, but this was refreshing, a smooth, full-bodied drink that was very pleasant. Cold-brew still isn’t my drink of choice, but I’d happily down a glass of that. I stayed for lunch, trying the frittata, with a mix of the three salads on the side. This too was excellent, served warm, while the salads were an interesting mix of tastes and textures. Finally, I popped back on my way to the station the following day for a cheeky decaf piccolo, a fitting send-off before my train. You can also see what I made of all the other branches of 200 Degrees that I’ve visited. This entry was posted in 200 Degrees, Breakfast, Cafe/Roaster, Cafes, Cake, Evening Opening, Laptop Friendly, Lunch, Nottingham, Retailers, Sandwiches, Stations Nearby and tagged include by Brian Williams. Bookmark the permalink.